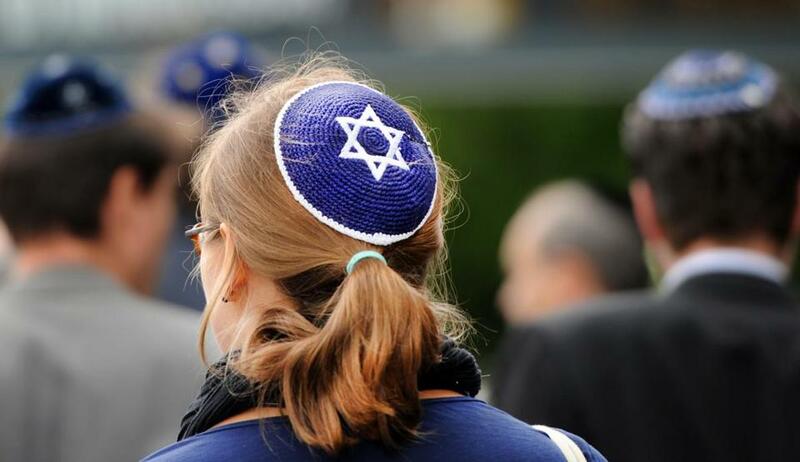 A woman wears a kippah as she takes part in a demonstration in Berlin. We found a similar pattern in a smaller study of over 2000 emails sent by citizens of eight European countries to their Israeli Embassies. We believe that the results are representative of similar anti-Semitic discourse worldwide, including in the United States, as a recent ADL investigation showed that 2.6 million anti-Semitic messages were posted on Twitter between August 2015 and July 2016. To be certain that we did not conflate anti-Jewish and anti-Israel sentiments, we defined in advance the definitions of criticism of Israeli policies and anti-Jewish hatred. Another startling conclusion of our study was that, contrary to popular assumptions, it is not exclusively alt-right, neo-Nazis and/or extreme left-wingers who think this way. On the contrary, the language of contemporary anti-Semitism, as in the past, is anchored in and spread by the educated mainstream as much as by fringe groups. Rather than physical attacks on Jews — with some exceptions — today’s assaults are verbal, ideological and cloaked in the guise of a critique of policies of the state of Israel. Looking at the messages as a whole, there was little variation among the different years except the spikes we noticed during times of military conflict, such as the 2014 war in Gaza. This event ignited a storm of anti-Israel and anti-Jewish commentary in Europe and the United States that continues to this day — spread most widely online. It is also interesting to note that these conflagrations were defined always in one-sided terms, with Israel as the sole aggressor. This unilateral framework applies not only to Israel’s military conflict with the Palestinians and Arab States but also to the condemnation of Israel for human-rights violations that are defined as almost exclusively characteristic of Israel in comparison to the records of other countries. When Israel, the Jewish state, is denounced as uniquely evil and immoral, anti-Semitism is clearly at play. Modern anti-Semites have turned “the Jewish problem” into “the Israel problem.” In this world where we are trying to eliminate racism, misogyny, homophobia, and more, it is time to include the age-old hatred of Jews as well.